V. cholerae is Gram-negative and comma-shaped. Initial isolates are slightly curved, whereas they can appear as straight rods upon laboratory culturing. 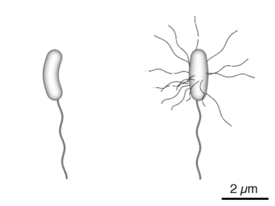 The bacterium has a flagellum at one cell pole as well as pili. V. cholerae is a facultative anaerobe, and can undergo respiratory and fermentative metabolism. V. cholerae pathogenicity genes code for proteins directly or indirectly involved in the virulence of the bacteria. During infection, V. cholerae secretes cholera toxin, a protein that causes profuse, watery diarrhea (known as "rice-water stool"). Colonization of the small intestine also requires the toxin coregulated pilus (TCP), a thin, flexible, filamentous appendage on the surface of bacterial cells. V. cholerae can cause syndromes ranging from asymptomatic to cholera gravis. In endemic areas, 75% of cases are asymptomatic, 20% are mild to moderate, and 2-5% are severe forms such as cholera gravis. Symptoms include abrupt onset of watery diarrhea (a grey and cloudy liquid), occasional vomiting, and abdominal cramps. Dehydration ensues, with symptoms and signs such as thirst, dry mucous membranes, decreased skin turgor, sunken eyes, hypotension, weak or absent radial pulse, tachycardia, tachypnea, hoarse voice, oliguria, cramps, renal failure, seizures, somnolence, coma, and death. Death due to dehydration can occur in a few hours to days in untreated children. The disease is also particularly dangerous for pregnant women and their fetuses during late pregnancy, as it may cause premature labor and fetal death. In cases of cholera gravis involving severe dehydration, up to 60% of patients can die; however, less than 1% of cases treated with rehydration therapy are fatal. The disease typically lasts 4–6 days. Worldwide, diarrhoeal disease, caused by cholera and many other pathogens, is the second-leading cause of death for children under the age of 5 and at least 120,000 deaths are estimated to be caused by cholera each year. In 2002, the WHO deemed that the case fatality ratio for cholera was about 3.95%. When visiting areas with epidemic cholera, the following precautions should be observed: drink and use bottled water; frequently wash hands with soap and safe water; use chemical toilets or bury feces if no restroom is available; do not defecate in any body of water and cook food thoroughly. A single dose vaccine is available for those traveling to an area where cholera is common. V. cholerae has two circular chromosomes, together totalling 4 million base pairs of DNA sequence and 3,885 predicted genes. The genes for cholera toxin are carried by CTXphi (CTXφ), a temperate bacteriophage inserted into the V. cholerae genome. CTXφ can transmit cholera toxin genes from one V. cholerae strain to another, one form of horizontal gene transfer. The genes for toxin coregulated pilus are coded by the Vibrio pathogenicity island (VPI). The entire genome of the virulent strain V. cholerae El Tor N16961 has been sequenced, and contains two circular chromosomes. Chromosome 1 has 2,961,149 base pairs with 2,770 open reading frames (ORF's) and chromosome 2 has 1,072,315 base pairs, 1,115 ORF's. The larger first chromosome contains the crucial genes for toxicity, regulation of toxicity, and important cellular functions, such as transcription and translation. The second chromosome is determined to be different from a plasmid or megaplasmid due to the inclusion of housekeeping and other essential genes in the genome, including essential genes for metabolism, heat-shock proteins, and 16S rRNA genes, which are ribosomal subunit genes used to track evolutionary relationships between bacteria. Also relevant in determining if the replicon is a chromosome is whether it represents a significant percentage of the genome, and chromosome 2 is 40% by size of the entire genome. And, unlike plasmids, chromosomes are not self-transmissible. However, the second chromosome may have once been a megaplasmid because it contains some genes usually found on plasmids. CTXφ (also called CTXphi) is a filamentous phage that contains the genes for cholera toxin. Infectious CTXφ particles are produced when V. cholerae infects humans. Phage particles are secreted from bacterial cells without lysis. When CTXφ infects V. cholerae cells, it integrates into specific sites on either chromosome. These sites often contain tandem arrays of integrated CTXφ prophage. In addition to the ctxA and ctxB genes encoding cholera toxin, CTXφ contains eight genes involved in phage reproduction, packaging, secretion, integration, and regulation. The CTXφ genome is 6.9 kb long. The Vibrio pathogenicity island (VPI) contains genes primarily involved in the production of toxin coregulated pilus (TCP). It is a large genetic element (about 40 kb) flanked by two repetitive regions (att-like sites), resembling a phage genome in structure. The VPI contains two gene clusters, the TCP cluster, and the ACF cluster, along with several other genes. The acf cluster is composed of four genes: acfABCD. The tcp cluster is composed of 15 genes: tcpABCDEFHIJPQRST and regulatory gene toxT. The main reservoirs of V. cholerae are people and aquatic sources such as brackish water and estuaries, often in association with copepods or other zooplankton, shellfish, and aquatic plants. 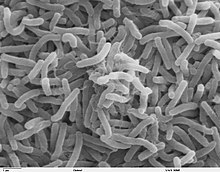 Cholera infections are most commonly acquired from drinking water in which V. cholerae is found naturally or into which it has been introduced from the feces of an infected person. Other common vehicles include contaminated fish and shellfish, produce, or leftover cooked grains that have not been properly reheated. Transmission from person to person, even to health care workers during epidemics, is rarely documented. V. cholerae thrives in a aquatic environment, particularly in surface water. The primary connection between humans and pathogenic strains is through water, particularly in economically reduced areas that do not have good water purification systems. Nonpathogenic strains are also present in water ecologies. The wide variety of pathogenic and nonpathogenic strains that co-exist in aquatic environments are thought to allow for so many genetic varieties. Gene transfer is fairly common amongst bacteria, and recombination of different V. cholerae genes can lead to new virulent strains. V. cholerae O1 has two biotypes, classical and El Tor, and each biotype has two distinct serotypes, Inaba and Ogawa. The symptoms of infection are indistinguishable, although more people infected with the El Tor biotype remain asymptomatic or have only a mild illness. In recent years, infections with the classical biotype of V. cholerae O1 have become rare and are limited to parts of Bangladesh and India. Recently, new variant strains have been detected in several parts of Asia and Africa. Observations suggest these strains cause more severe cholera with higher case fatality rates. V. cholerae can be induced to become competent for natural genetic transformation when grown on chitin, a biopolymer that is abundant in aquatic habitats (e.g. from crustacean exoskeletons). Natural genetic transformation is a sexual process involving DNA transfer from one bacterial cell to another through the intervening medium, and the integration of the donor sequence into the recipient genome by homologous recombination. Transformation competence in V. cholerae is stimulated by increasing cell density accompanied by nutrient limitation, a decline in growth rate, or stress. The V. cholerae uptake machinery involves a competence-induced pilus, and a conserved DNA binding protein that acts as a ratchet to reel DNA into the cytoplasm. ^ a b c d e f g "Laboratory Methods for the Diagnosis of Vibrio cholerae" (PDF). Centre for Disease Control. Retrieved 29 October 2013. ^ Bentivoglio, M; Pacini, P (1995). "Filippo Pacini: A determined observer" (PDF). Brain Research Bulletin. 38 (2): 161–5. CiteSeerX 10.1.1.362.6850. doi:10.1016/0361-9230(95)00083-Q. PMID 7583342. ^ a b c d e f g h i Howard-Jones, N (1984). "Robert Koch and the cholera vibrio: a centenary". BMJ. 288 (6414): 379–81. doi:10.1136/bmj.288.6414.379. PMC 1444283. PMID 6419937. ^ Davis, B; Waldor, M. K. (February 2003). "Filamentous phages linked to virulence of Vibrio cholerae". Current Opinion in Microbiology. 6 (1): 35–42. doi:10.1016/S1369-5274(02)00005-X. PMID 12615217. ^ Boyd, EF; Waldor, MK (Jun 2002). "Evolutionary and functional analyses of variants of the toxin-coregulated pilus protein TcpA from toxigenic Vibrio cholerae non-O1/non-O139 serogroup isolates". Microbiology. 148 (Pt 6): 1655–66. doi:10.1099/00221287-148-6-1655. PMID 12055286. ^ Miller, Melissa B.; Skorupski, Karen; Lenz, Derrick H.; Taylor, Ronald K.; Bassler, Bonnie L. (August 2002). "Parallel Quorum Sensing Systems Converge to Regulate Virulence in Vibrio cholerae". Cell. 110 (3): 303–314. doi:10.1016/S0092-8674(02)00829-2. PMID 12176318. ^ Nielsen, Alex Toftgaard; Dolganov, Nadia A.; Otto, Glen; Miller, Michael C.; Wu, Cheng Yen; Schoolnik, Gary K. (2006). "RpoS Controls the Vibrio cholerae Mucosal Escape Response". PLoS Pathogens. 2 (10): e109. doi:10.1371/journal.ppat.0020109. PMC 1617127. PMID 17054394. ^ a b Faruque, SM; Albert, MJ; Mekalanos, JJ (Dec 1998). "Epidemiology, genetics, and ecology of toxigenic Vibrio cholerae". Microbiology and Molecular Biology Reviews. 62 (4): 1301–14. PMC 98947. PMID 9841673. ^ Fraser, Claire M.; Heidelberg, John F.; Eisen, Jonathan A.; Nelson, William C.; Clayton, Rebecca A.; Gwinn, Michelle L.; Dodson, Robert J.; Haft, Daniel H.; et al. (2000). "DNA sequence of both chromosomes of the cholera pathogen Vibrio cholerae" (PDF). Nature. 406 (6795): 477–83. doi:10.1038/35020000. PMID 10952301. ^ McLeod, S. M.; Kimsey, H. H.; Davis, B. M.; Waldor, M. K. (2005). "CTXφ and Vibrio cholerae: exploring a newly recognized type of phage-host cell relationship". Molecular Microbiology. 57 (2): 347–356. doi:10.1111/j.1365-2958.2005.04676.x. PMID 15978069. ^ Robins, WP; Mekalanos, JJ (2014). Genomic science in understanding cholera outbreaks and evolution of Vibrio cholerae as a human pathogen. Current Topics in Microbiology and Immunology. 379. pp. 211–29. doi:10.1007/82_2014_366. ISBN 978-3-642-55403-2. PMC 4153709. PMID 24590676. ^ Lutz, Carla; Erken, Martina; Noorian, Parisa; Sun, Shuyang; McDougald, Diane (2013). "Environmental reservoirs and mechanisms of persistence of Vibrio cholerae". Frontiers in Microbiology. 4: 375. doi:10.3389/fmicb.2013.00375. ISSN 1664-302X. PMC 3863721. PMID 24379807. ^ Faruque, SM; Nair, GB (2002). "Molecular ecology of toxigenic Vibrio cholerae". Microbiology and Immunology. 46 (2): 59–66. doi:10.1111/j.1348-0421.2002.tb02659.x. PMID 11939579. ^ Siddique, A.K. ; Baqui, A.H.; Eusof, A.; Haider, K.; Hossain, M.A. ; Bashir, I.; Zaman, K. (1991). "Survival of classic cholera in Bangladesh". The Lancet. 337 (8750): 1125–1127. doi:10.1016/0140-6736(91)92789-5. ^ a b Meibom KL, Blokesch M, Dolganov NA, Wu CY, Schoolnik GK (2005). "Chitin induces natural competence in Vibrio cholerae". Science. 310 (5755): 1824–7. Bibcode:2005Sci...310.1824M. doi:10.1126/science.1120096. PMID 16357262. ^ quintdaily (3 August 2017). "Vibrio Cholera Starts Spreading In India – QuintDaily". Wikimedia Commons has media related to Vibrio cholerae.